This was probably my sixth or seventh time as a host there. 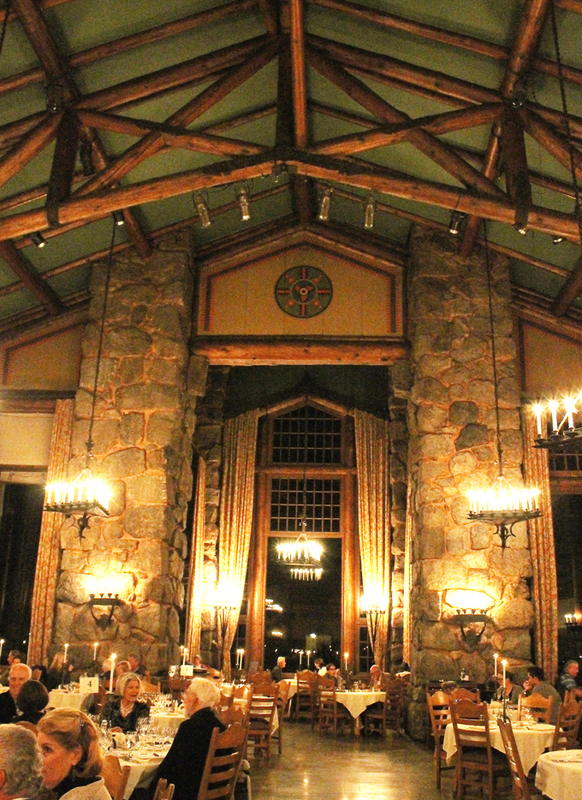 And there were plenty of “Taste of Yosemite” regulars who come year after year. As it was early November, there was no snow. But the sunny, crisp days meant you could get out for a hike every day — all the better to burn off all the calories to come. 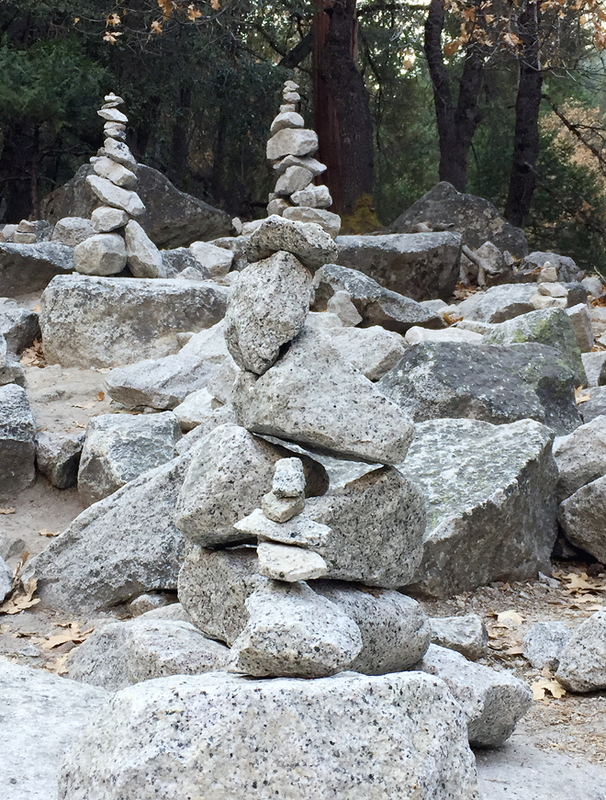 Rock sculptures at Mirror Lake. 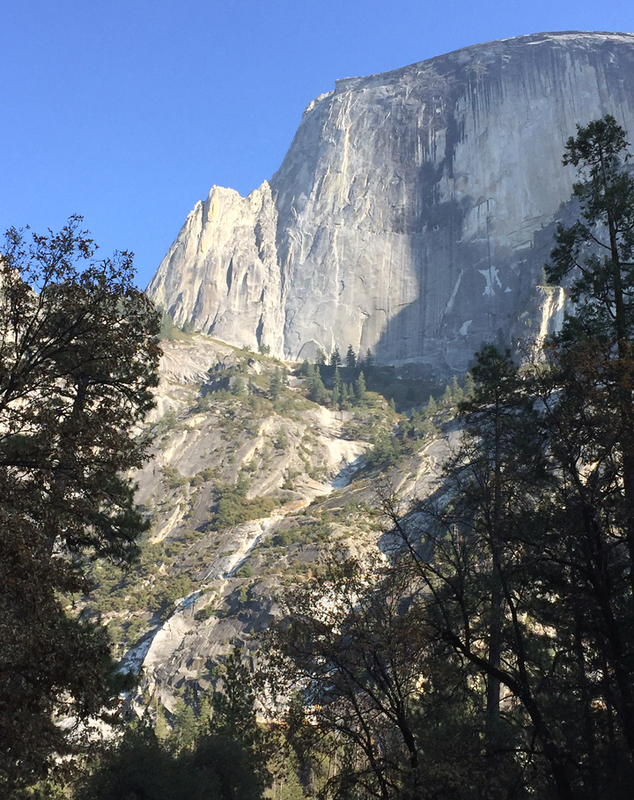 No matter what time of year, Yosemite is always a treat to explore. Even better, this year marked the opening of the Mariposa Grove after a three-year restoration project. 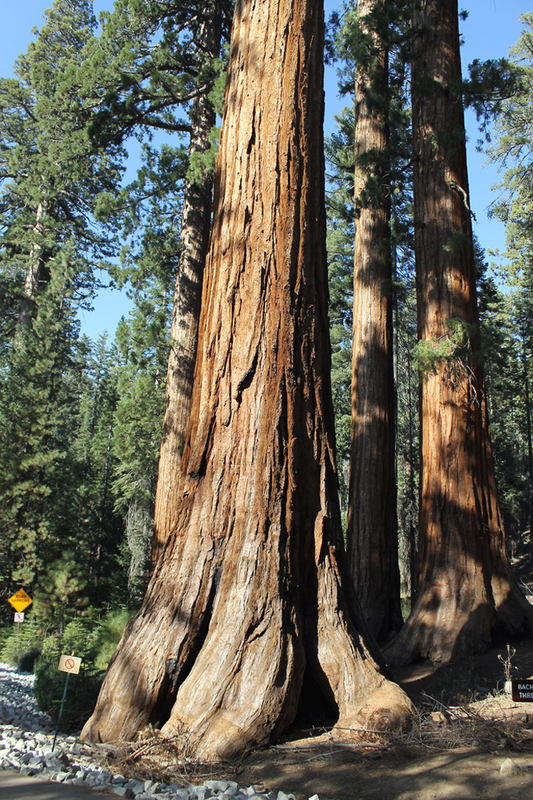 It is home to giant sequoias more than 1,000 years old. They will take your breath away. Indeed, you might get a cramp in your neck, craning to look at their immense height in their entirety. No mere photo or video can really capture their enormity. You have to see them to really appreciate them. 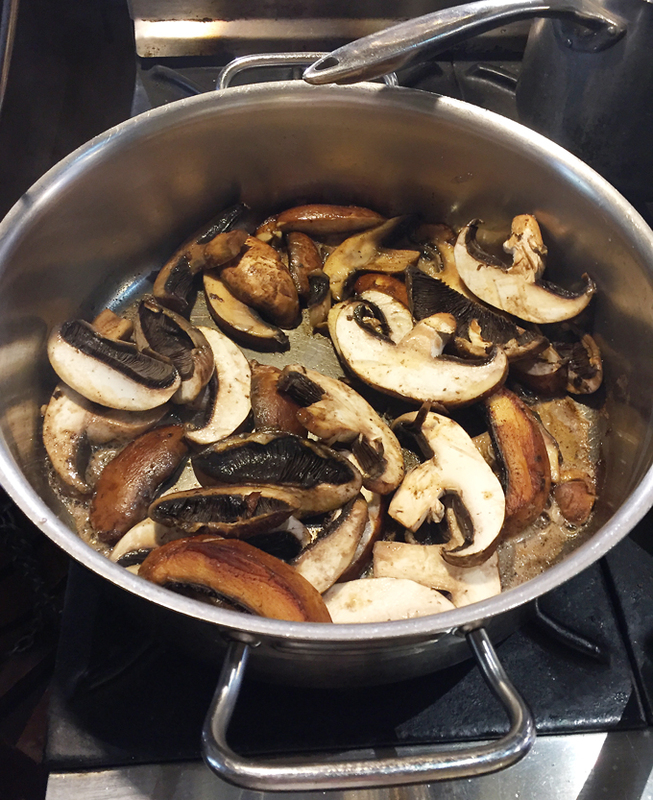 The makings of a delectable mushroom soup. 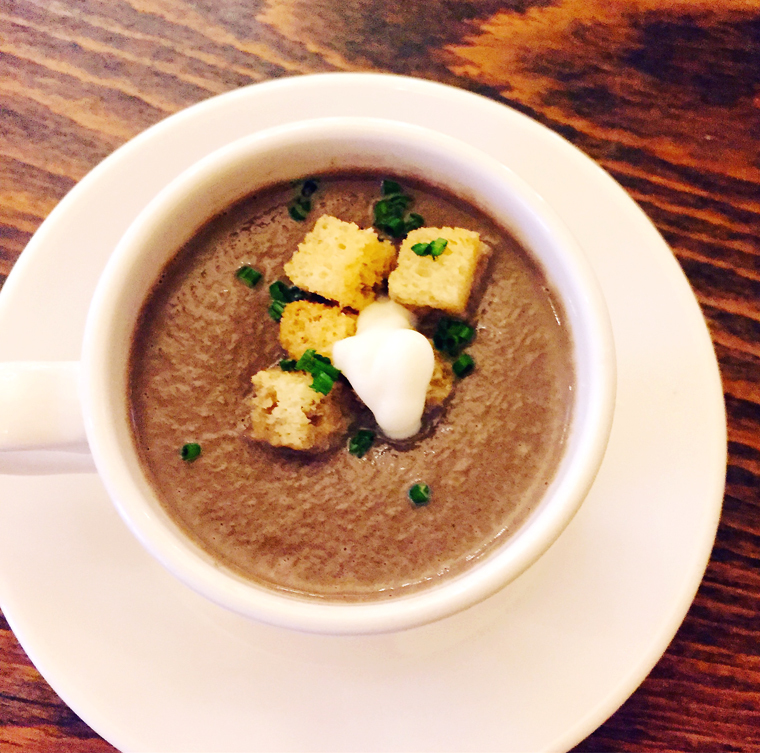 Peter Armellino’s mushroom soup garnished with croutons. 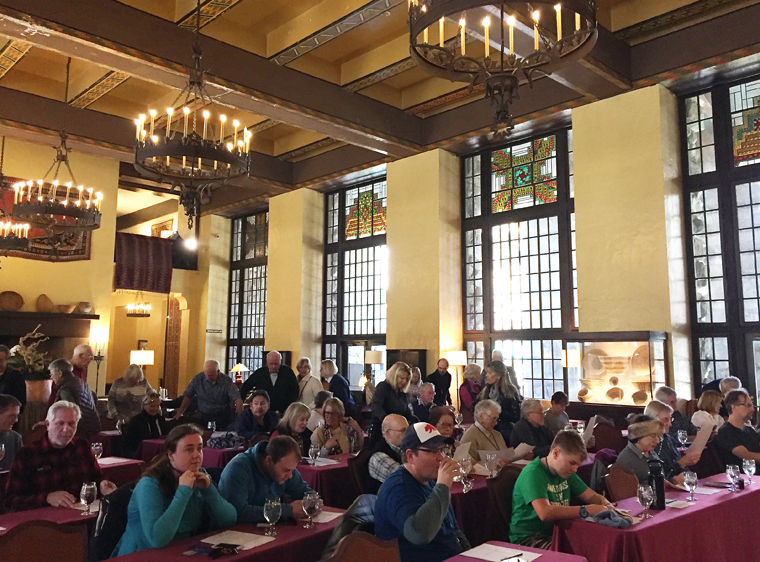 After that jaunt, it was back inside The Majestic for the first session, which was headlined by a chef from my neck of the woods: Peter Armellino of the Michelin-starred Plumed Horse in Los Gatos. 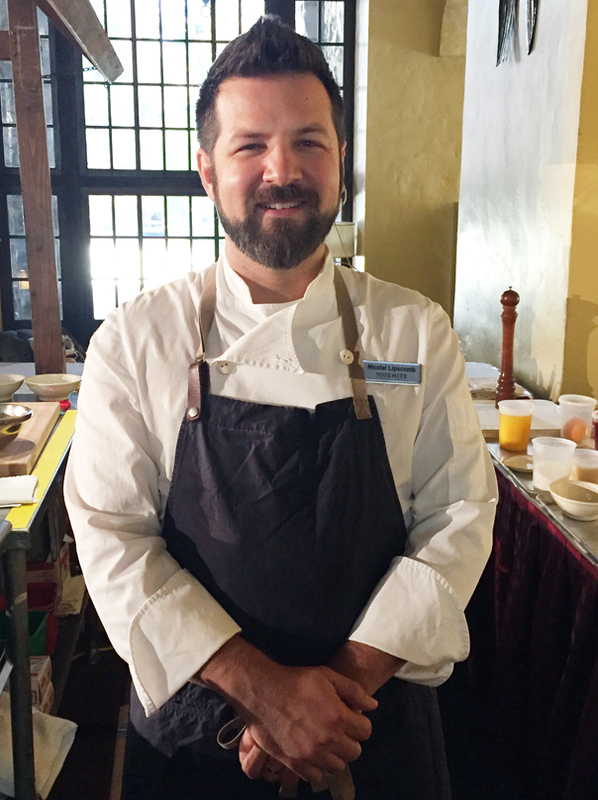 Although a little under the weather, he trudged on like a trooper, showing how to make his incredibly smooth and earthy mushroom soup in his demo that’s so popular at his more casual Pasta Armellino restaurant in Los Gatos. The audience at the first demo. 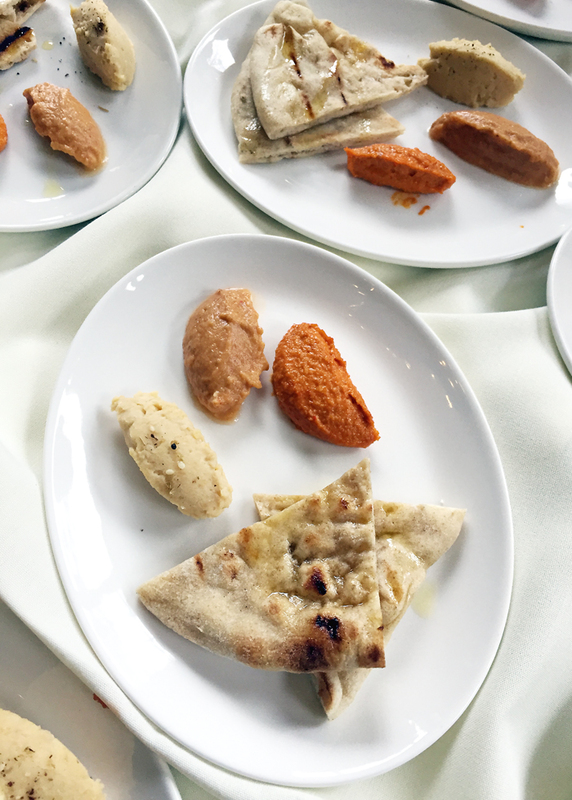 He was joined by everyone’s favorite cheese ambassadors, Sue Conley & Peggy Smith of Cowgirl Creamery, who went through a tasting of their cheeses to educate about the effect of aging, and what pairs best with each type of cheese. 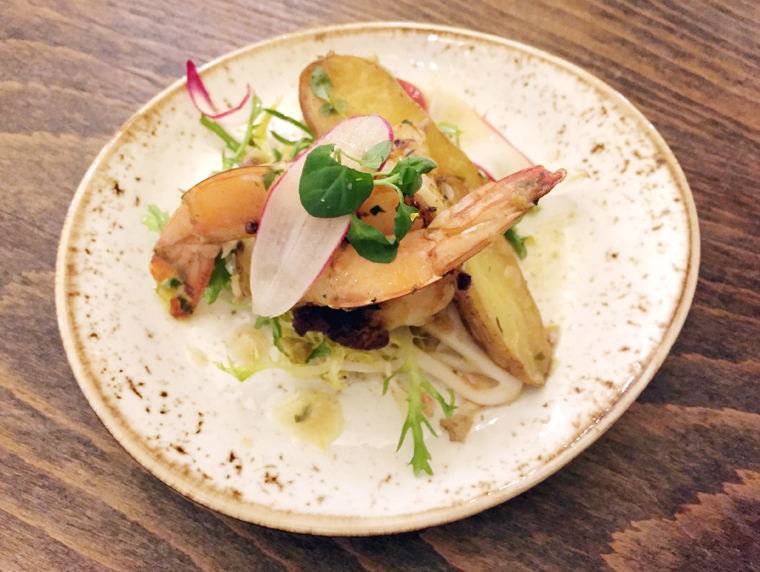 Chef Adam Mali, the newly installed executive chef of The Battery in San Francisco, demonstrated how to confit tomatoes in the oven, low and slow, to accent charred Gulf shrimp and fingerling potatoes. The splashy The Battery is a huge member-only club with a bar, restaurant and hotel. That means if you want a bigger taste of Mali’s food, you have to hope a member invites you in. 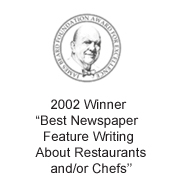 Or you can pay to stay in one of the hotel rooms to get an “in” at the restaurant. 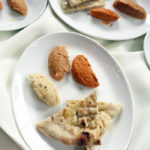 Armellino’s gala dinner began with his own smoked sturgeon, the silky, smoky fish accented with the sweetness of Sugar Pie pumpkin and Granny Smith apple, along with the piquant bite of whole grain mustard. 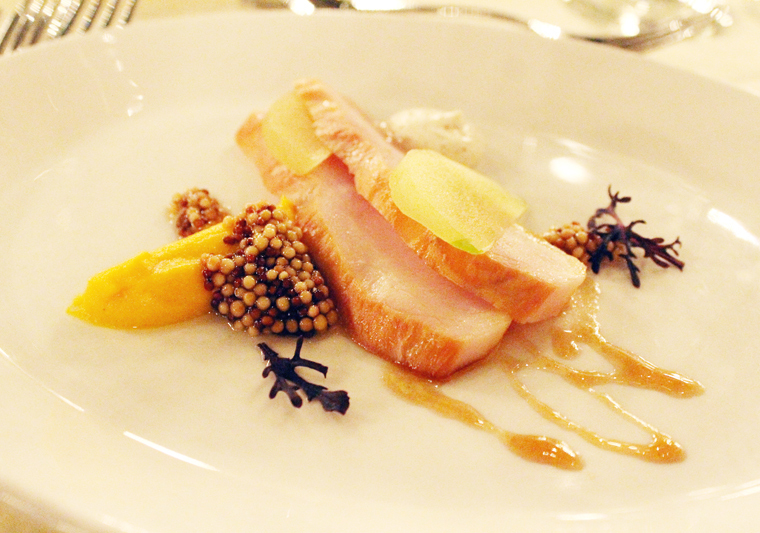 The first course of smoked sturgeon at the gala dinner. 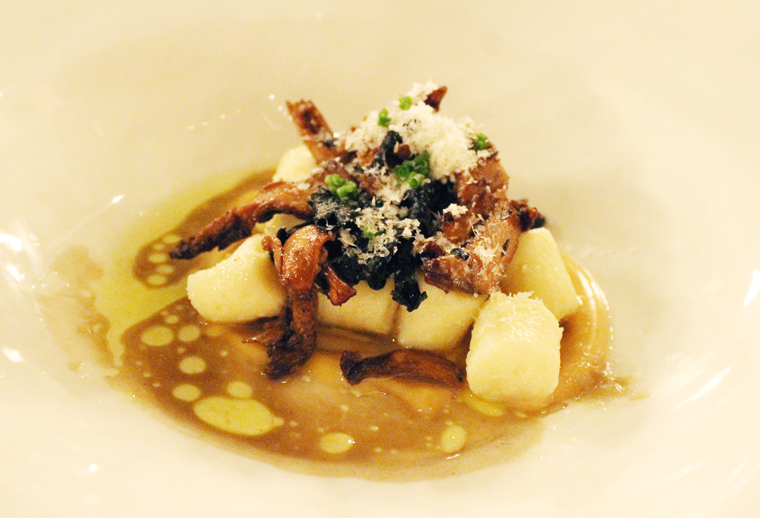 Next, my favorite course: pillowy ricotta gnocchi with roasted foraged mushrooms and a touch of truffle butter. 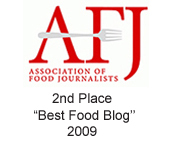 If you closed your eyes and took a forkful of the next dish, you might think you were eating Thanksgiving dinner. 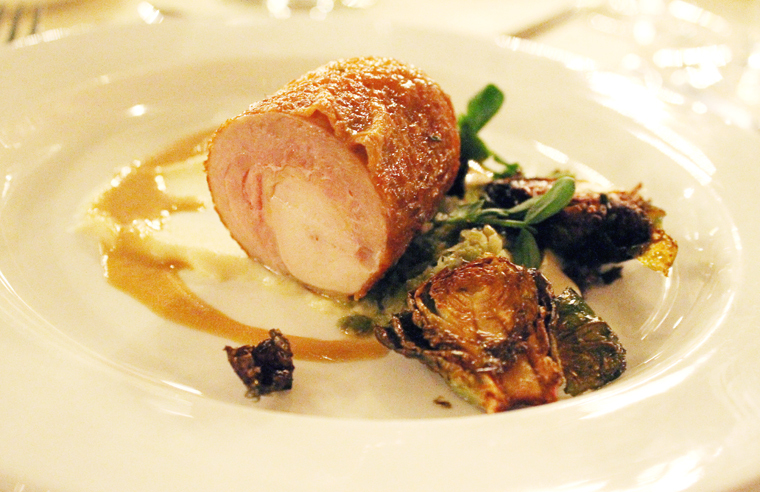 The Guinea hen roulade with its foie gras emulsion mimicked the taste of roast turkey, stuffing and gravy. 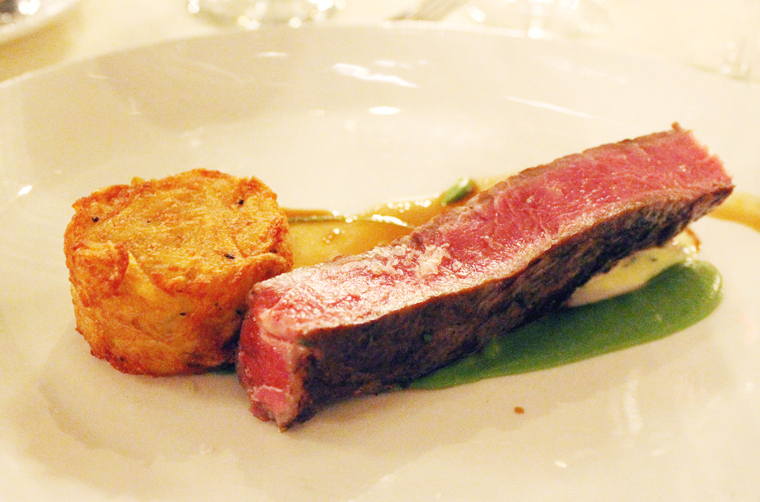 Sirloin steak to sink your teeth into. 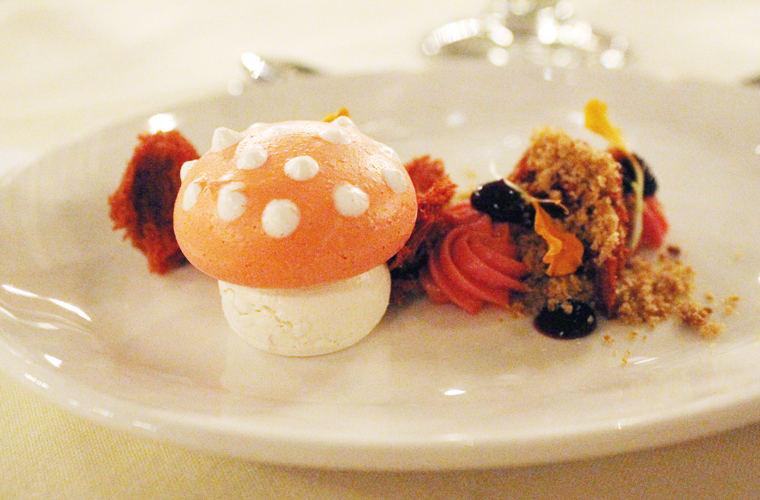 A cute meringue mushroom is the centerpiece of this dessert. A sizeable slab of perfectly medium-rare roast sirloin was a meat lover’s dream, accompanied with charred onion, heirloom spinach, fingerling potatoes and a smoked bernaise sauce. Dessert featured an outsized meringue mushroom in sort of a deconstructed bouche de Noel with small pieces of airy, torn coffee cake, dollops of chocolate mousse and dabs of sweet-tart passion fruit gel. 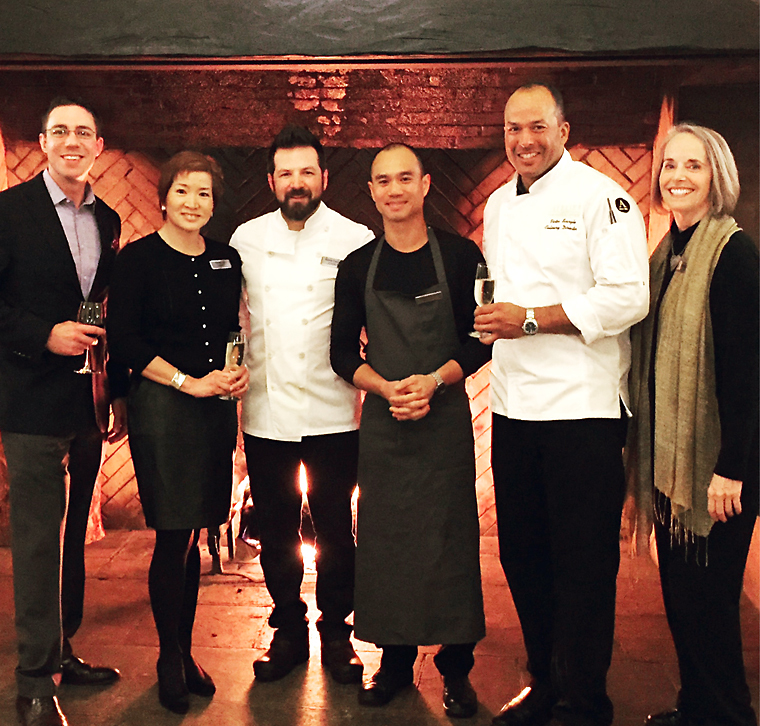 Yours truly with chefs Nicolai Lipscomb, James Syhabout, and Victor Scargle with Yosemite staff members. 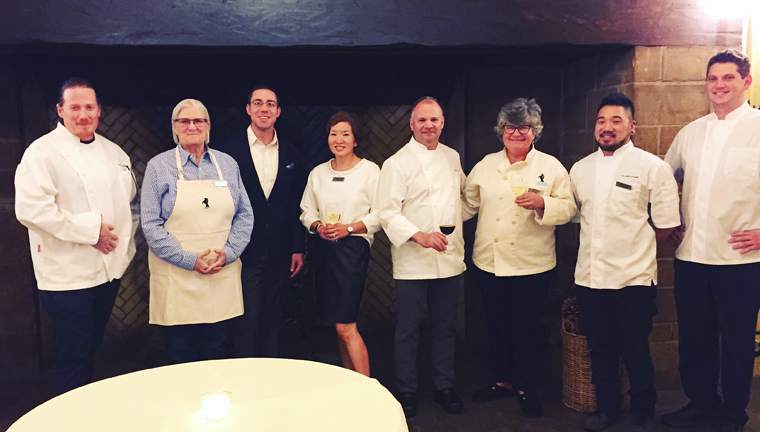 Then, it was on to the next session, headlined by Victor Scargle, culinary director for the Boisset Collection in the Napa Valley, a family-owned wine, food, and lifestyle brand that also does high-end catering and has a gourmet boutique in downtown Yountville. 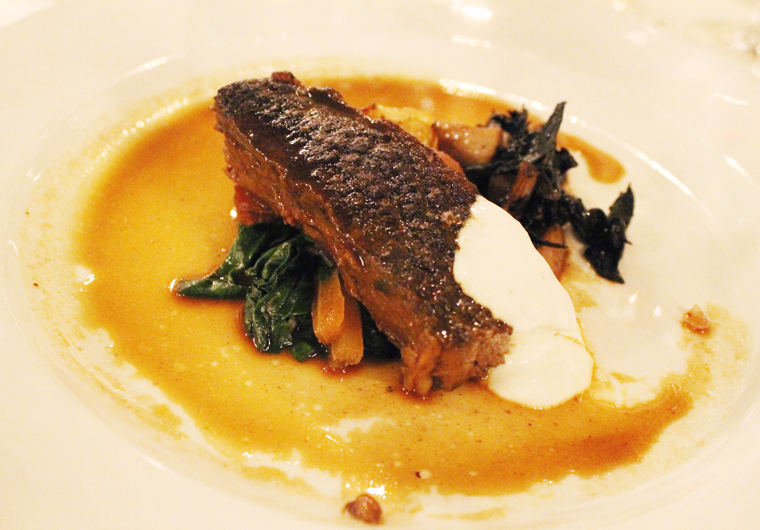 Scargle showed off a sunchoke soup during his demo, as well as braised short ribs that also were part of his gala dinner menu. 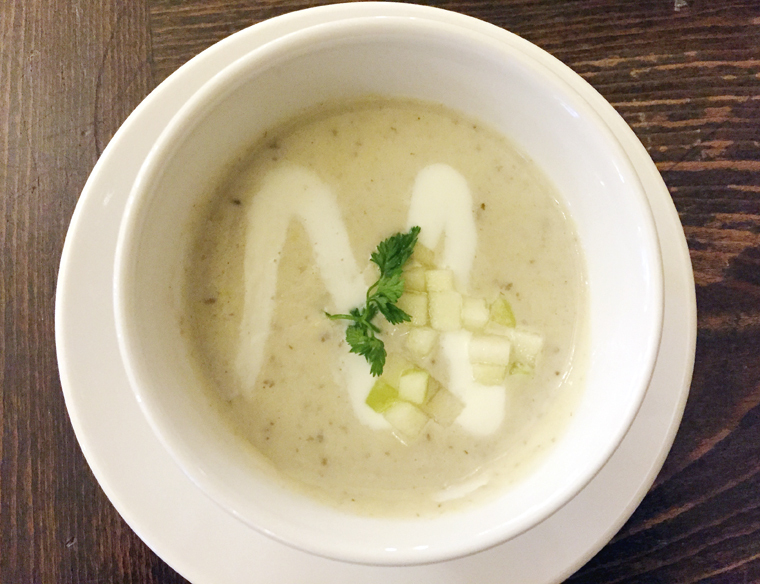 Winter was made for this sunchoke soup. 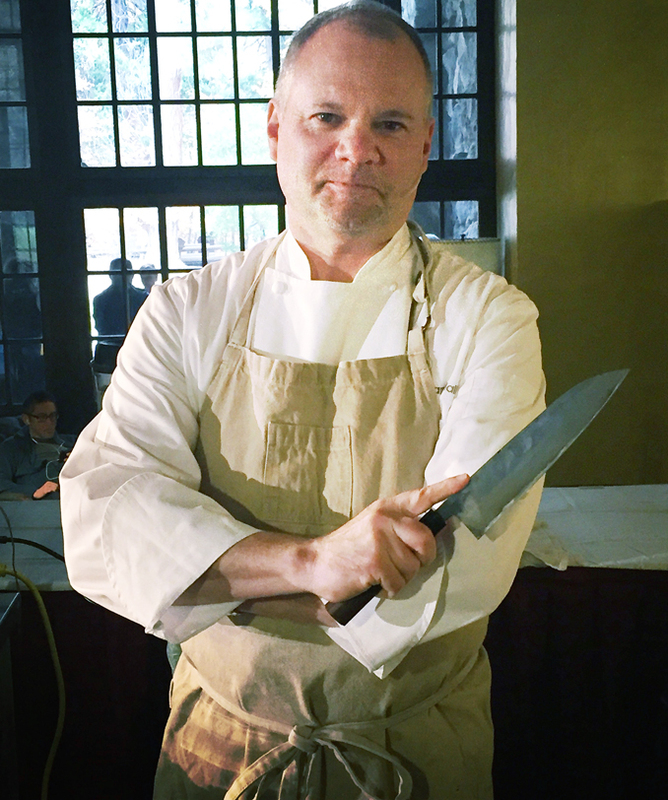 Nicolai Lipscomb, formerly the head chef of The Battery — yes, that Battery — and newly transplanted to Sacramento, where he hopes to open his own restaurant next year, was all about the holidays in his demo. 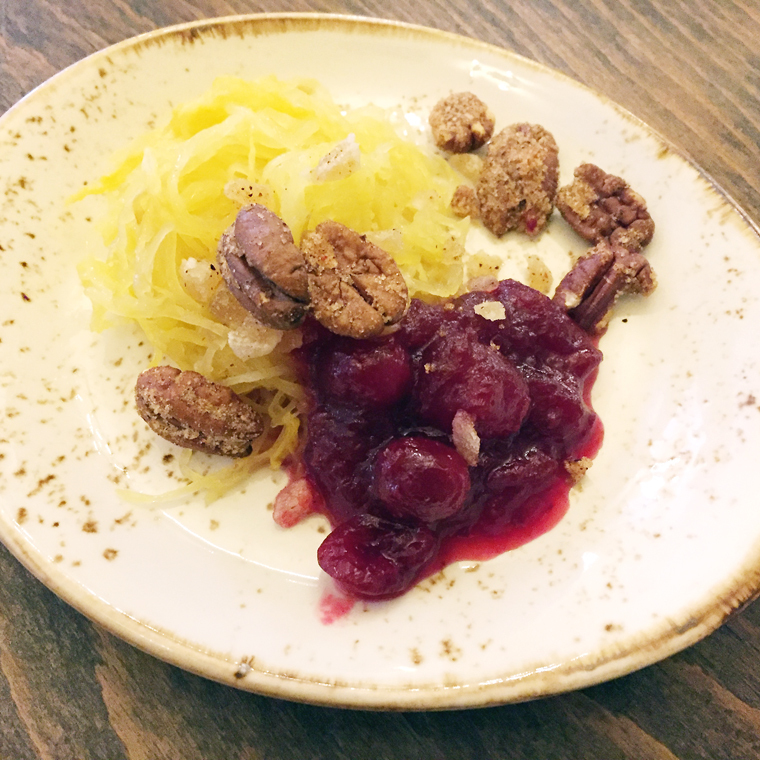 Spaghetti squash, candied pecans and cranberry sauce. He showcased candied pecans, cranberry sauce, and a nifty way to roast spaghetti squash that he learned from Pinterest. 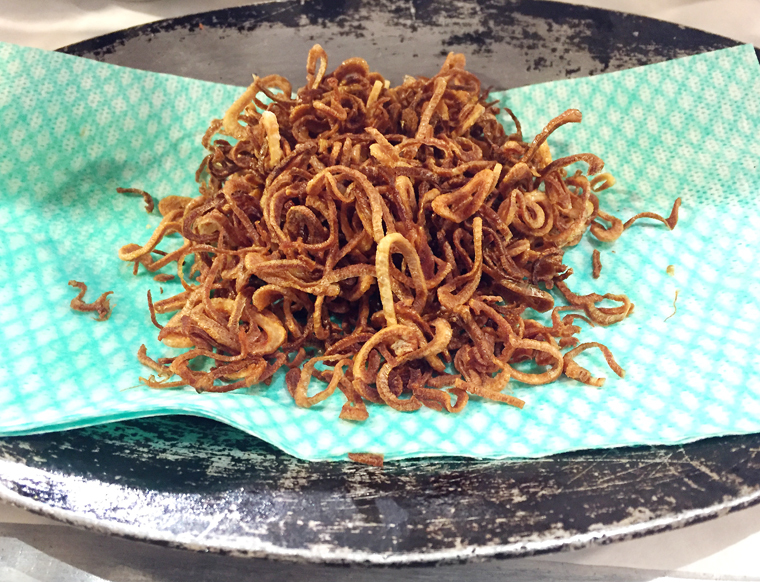 Instead of cutting the squash in half vertically to roast, he cuts it in rings, which yields longer spaghetti-like strands after fluffing with a fork. 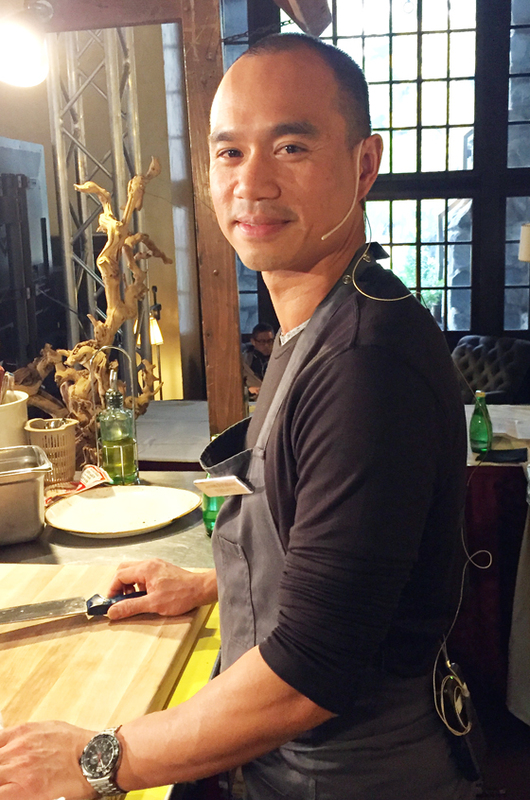 Chef James Syhabout at the ready. 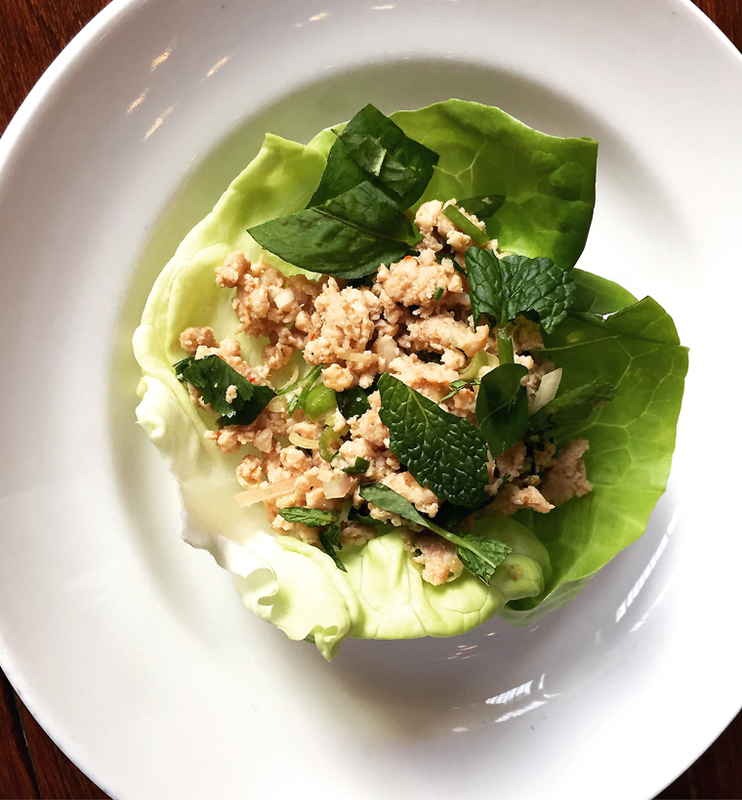 James Syhabout of Hawker Fare in San Francisco took the audience on a taste of Laos with his two dishes: dry-fried rice noodles that’s a Laotian riff of pad thai, and a spicy minced chicken salad with herbs eaten piled into lettuce cups. 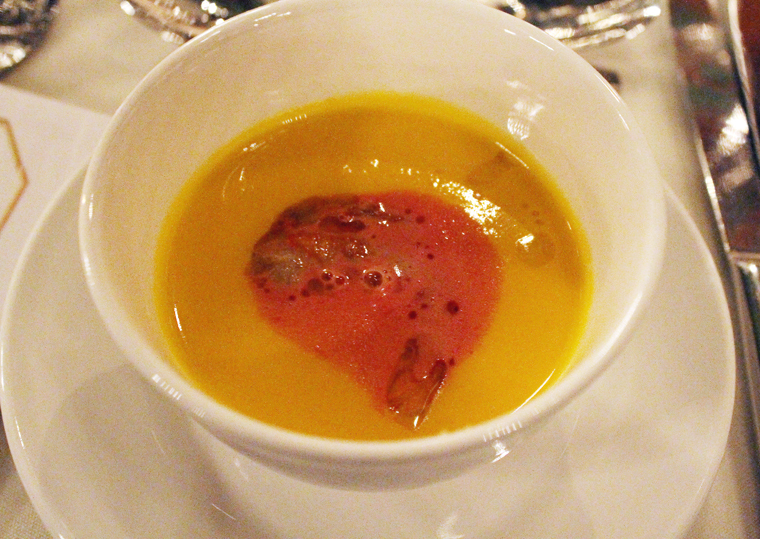 For the gala dinner, Scargle opened with a smooth butternut squash soup that hid a whole butter-poached spot prawn — perfect on a chilly evening. Next came his autumn take on panzanella, swapping out tomatoes for grilled winter greens to go along with fresh mozzarella and plenty of confit garlic. 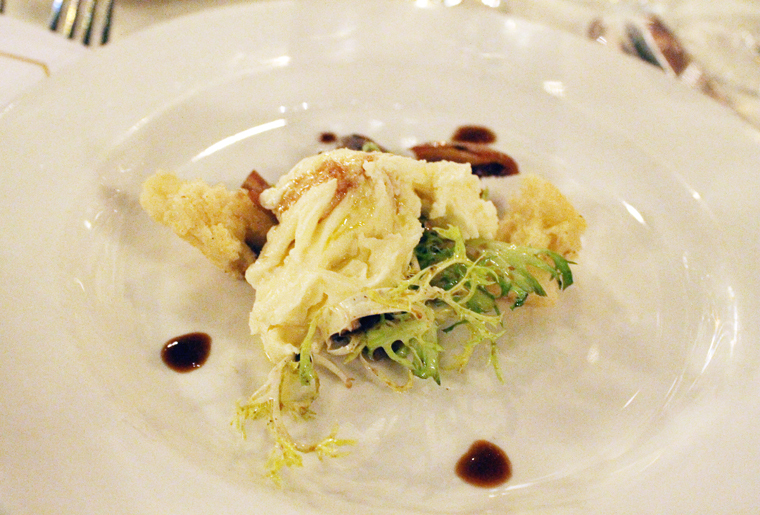 The guests around me all remarked that they’d never had stingray before. 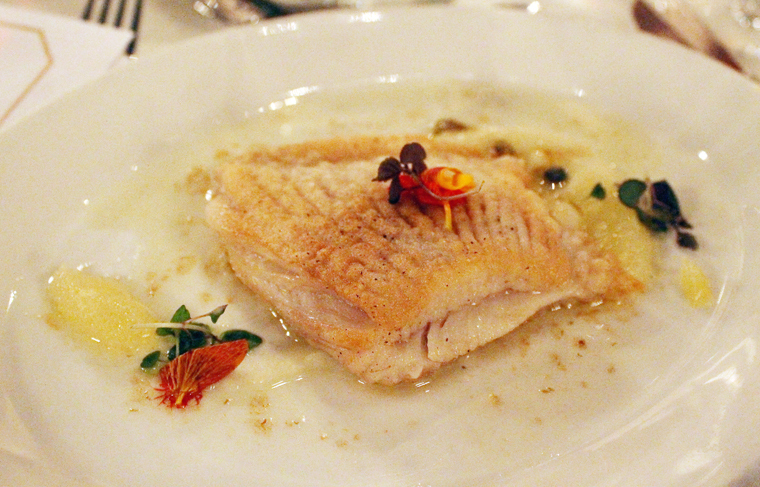 Similar to skate, but much larger, the tender, striated fillet was served with a classic lemon caper brown butter sauce over a smear of sunchoke puree. Then came those fall-apart tender Burgundy-braised short ribs with heavenly duck confit potatoes, and a hit of horseradish cream. 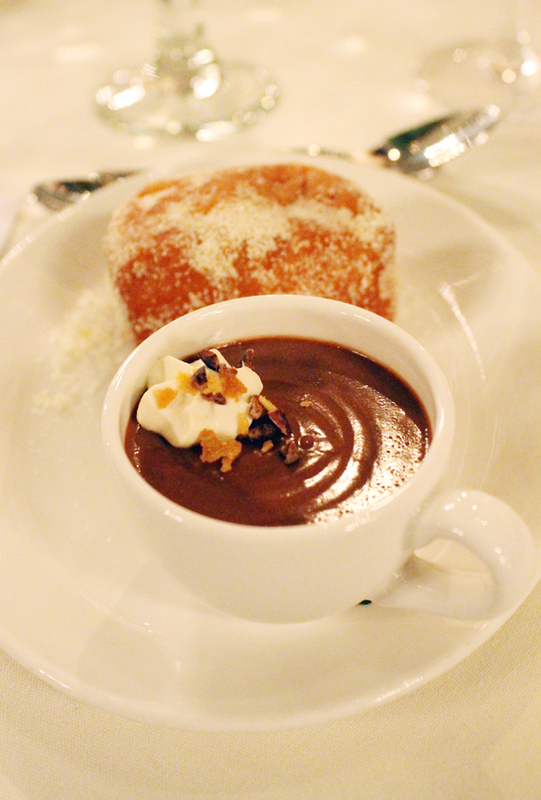 Dessert was a total crowd-pleaser: dark chocolate pot de creme served alongside a big, just-fried citrus beignet. Hard to beat chocolate pot de creme with a warm beignet. Cheers to that, and the next one in 2020. 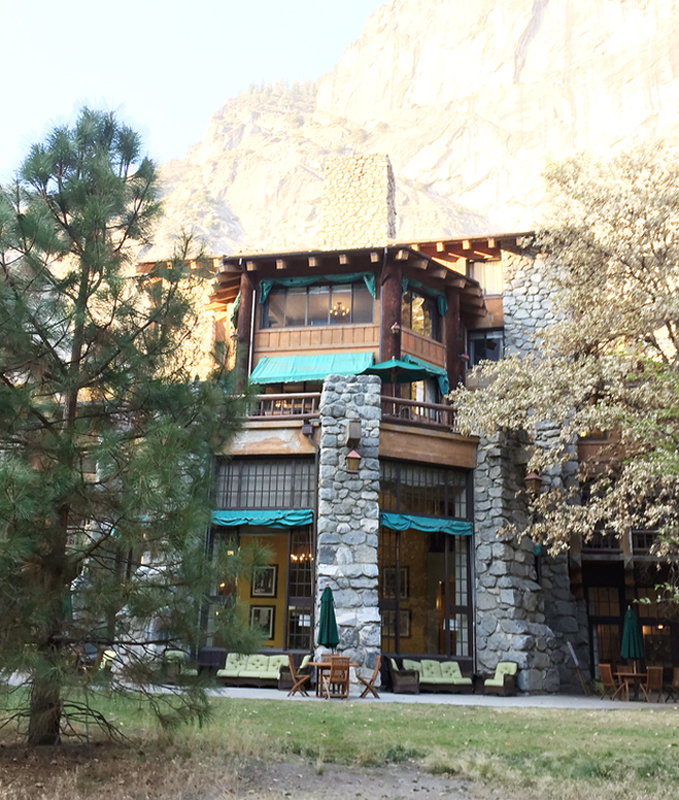 Always so exciting to see your Yosemite dinners. Sad we have to wait till 2020 for the next one. But maybe that’ll be enough time for me to save up the money for a ticket. LOL. Fabulous, Carolyn!. Great info, great photos (as always). 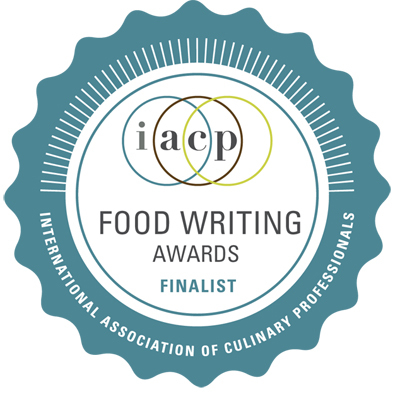 Definitely an amazing experience and food presentations! And you look super chic.